Protester in Olympia, WA, February 16, 2010. Image from the Washington State Wire. What’s needed at this political moment? I was struck by how openly they disagreed [and] by how passionate all five of them are about creating a more just society. Betsy Leondar-Wright and Gail Leondar-Wright will be Thorne Dreyer's guests on Rag Radio, Friday, June 22, from 2-3 p.m. (CDT) on KOOP 91.7-FM in Austin and streamed live on the web. Betsy and Gail will discuss their marriage, the gay marriage and LGBT movements in America, and the larger issues of class and progressive social change. 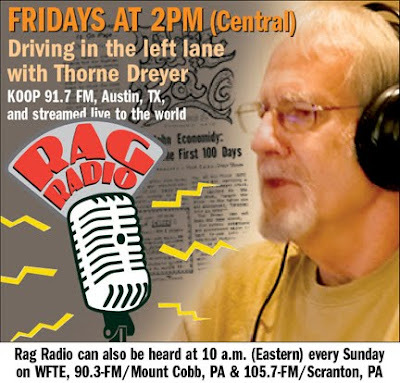 The show will be rebroadcast on WFTE-FM in Scranton and Mt. Cobb, PA, Sunday, June 10, at 10 a.m. (EDT). After broadcast, all Rag Radio interviews are posted as podcasts at the Internet Archive. At the Working-Class Studies conference on Friday, June 8, I heard an amazing dialogue Friday, June 8, about class, race, and movement-building by five progressive journalists and activist scholars: Juan Gonzalez of Democracy Now!, Frances Fox Piven, Bill Fletcher Jr. of Blackcommentator.com , and former New York Times columnist Bob Herbert of Demos, with conference organizer Michael Zweig, author of The Working Class Majority moderating. Juan Gonzalez: We have to start saying “working class” again. When politicians say “the middle class,” their purpose is to exclude poor and immigrant labor from the American people. The key responsibility of progressives is to reject this concept of the middle class. Frances Fox Piven: The Citizens United Supreme Court decision (allowing corporate personhood and unlimited secret spending on elections) raises the problem of propaganda in the U.S. We’ve always had corporate and elite propaganda, but now the problem is much worse. The complexity of the financial crisis makes populist organizing difficult. The Citizens United decision is responsible for the defeat of the Wisconsin recall vote (to remove anti-union Governor Scott Walker); we are watching the downfall of representative democracy. A disruptive movement is needed. Bill Fletcher: Just as in the movie When Worlds Collide, in which only a few people can escape a collision of planets, the capitalist class senses an impending disaster -- and the disaster is all of us! They learned from Obama’s election and the Wisconsin recall (47% is a lot of people) that they can no longer rule through electoral politics, and they are debating among themselves what other means they should turn to. That’s the implication of the Citizens United ruling. The chickens are coming home to roost on unions’ failure to educate their own members. Bob Herbert: The U.S. is in much worse shape than the media reveal. My next book is called The Wounded Colossus. 100 million people are poor or near poor, one-third of the U.S. population. Even the solidly middle class are in deep trouble, heading towards poverty, with the cost of college, homes under water, debt, health care costs, and no job security. We already were not a functioning democracy before Citizens United. President Obama won’t even say the word “poor,” only “the middle class.” There’s no way to replace 14 million lost jobs. Frances Fox Piven: To revive working-class movements, don’t start with existing unions. Juan Gonzalez: Latin America has broken free of the U.S. and gone in a different direction; so have parts of the Arab world, charting their own course. U.S. capitalists are desperate and are turning to re-conquering Europe by taking away its social progress. Immigrants are the most progressive portion of the U.S. working class. Think about the Republic Windows and Doors occupation! Bill Fletcher: Economically precarious white people must come to see that Mitt Romney is not their champion. How can that happen? The difficulty in building working-class solidarity is race. Saying “middle class” symbolizes escape from the bottom, from poverty. 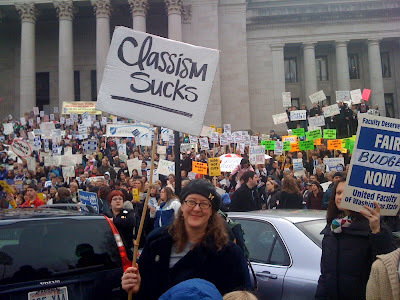 It’s not about tactics; first we have to re-shape the concept of unions by re-defining class. Bob Herbert: There’s no coherent message, no definition of “working-class.” The one unifying issue is employment. If you don’t address race you’re lost from the jump. If people aren’t educated about divide and conquer tactics, about how their interests coincide, about the common interests of all who work, we won’t be able to fight back against divide-and-conquer. Bob Herbert: That’s an intellectual argument that won’t persuade white racists. Some whites don’t want to be associated with poor blacks. Just talk about jobs for all. Frances Fox Piven: Bob says the two unifying issues are jobs and avoiding divide-and-conquer -- but jobs have long been the Right’s issue; stressing them will lead to President Romney. We over-rely on jobs, but we do care about what kind of jobs, paying how much, producing what, how ecologically. Pay more attention to race. When the Tea Party members yell “Take it back!,” they mean take it back from people of color. We have to have a dialogue on race to get solidarity across race. Bob Herbert: It’s not going to happen. Racism is too entrenched. The evil-doers are too well-funded. Blacks will get more by fighting for themselves, like in the 1950s and ‘60s. We have a black president who won’t even say the word “black”! Cross-race solidarity won’t happen. Bill Fletcher: A militant African American movement is not inconsistent with working-class solidarity. When blacks are passive, racism and division increases. When blacks are active, they chip away at racism. A majoritarian block won’t include all whites, but will include some. To deconstruct the racial myth held by so many whites, we need a strong left, not wishful thinking about a “kumbaya moment,” but really dealing with the class divide. Bob Herbert: They are still two separate issues: a militant black-initiated movement for racial justice and a working-class movement. If you focus on race, whites will bolt; they won’t enter. Audience member: There were several historical moments when many whites stood up for black rights, in the 1930s, the 1960s. Bob Herbert: I vehemently disagree. Most whites voted against Barack Obama. Look at the voting rights attacks now, and the police doing stop-and-frisk in New York City. Juan Gonzalez: The persistence of racism is amazing. It used to be that the U.S.was segregated in two homogeneous worlds, white and black. Today’s young people are different, even young whites; they live mixed-race lives. But the ruling circles need those divisions. We fail to understand the critical role of the mass media, the absence of working-class perspectives in the media. What newspaper is waging a campaign against inequality? We need independent media. Democracy Now! is a phenomenal success, but it’s just one show. The discussion after the panel was heated, with lots of arguing about racism, unions, and movement-building strategy. I noticed that the most pessimistic panelist, Bob Herbert, was also the one with the least activist experience; the most hopeful panelists were those who have been social change practitioners as well as political observers. For myself, my reaction was to agree with Bill Fletcher and Frances Fox Piven that the solutions won’t be found just in electoral politics and existing unions; change will come primarily from movement-building and strategic campaigns of (nonviolent) disruptive direct action.